A steam turbine generator works by heating water to extremely high temperatures until it is converted into steam, then the steam energy is used to rotate the blades of a turbine to create mechanical or rotational energy. This rotational energy caused by the high pressured steam turbine is used to generate electricity from an attached generator. (1) A heat source of some sort — perhaps a combusted fossil fuel or solar heat — is used to create heat energy. (2) The boiler, which contains water, uses the heat energy to convert the water into high pressure steam. (3) If the system is using a combustible fossil fuel as a heat source, then an exhaust pipe is needed to release the pollutants. If the system uses solar energy for the heat conversion, then an exhaust pipe is not needed because the solar energy system will not release any pollutants. 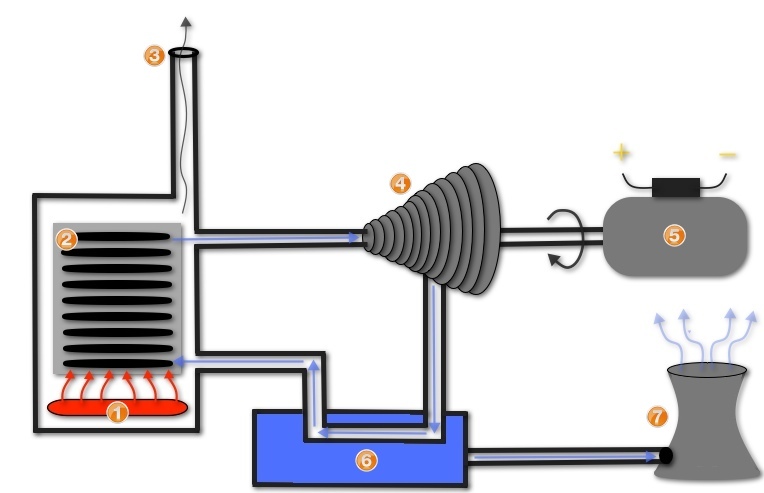 (4) The steam from the water in the boiler is pumped into the steam turbine. The steam energy spins the turbine blades. (5) The generator is attached to the steam turbine by a rotating shaft. 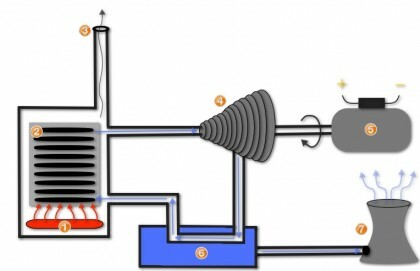 As the steam turbine spins, the generator spins and creates electricity. (7) The cooling tower releases the already used, lower energy, and cooled steam into the atmosphere. The remaining water that is cooled back into a liquid state is pumped back into the boiler and repeats the process again, creating more energy from steam.